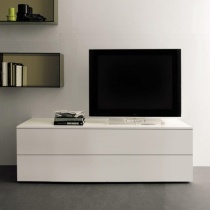 Amode are specialists in contemporary Italian TV units. All of our TV units are made in Italy, and are of the highest design and quality standards available. Our fully comprehensive collection of TV tables start from as small as 90cm in length and go all the way up to 300cm in length. 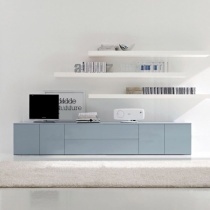 When buying a modern TV unit it is important to think of what types of items you wish to store inside the tv table. Our Mix modern TV units come in two depths: 41cm or 57cm depths, so that you can choose the correct size depending on the dimensions of you a/v equipment. 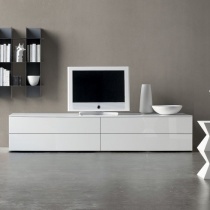 Our best selling Mix TV unit collection is a brand new concept that will change the way you search for storage furniture. 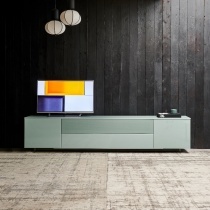 Exclusive to Amode, the Mix range allows you to pair practicality with creativity to select the perfect TV unit that will meet all of your storage and aesthetic needs. The Mix range of designer TV cabinets come with various opening and storage options such as standard door, drawers, drop-down doors and open shelves. The open shelves are ideal for putting a/v gear inside as you are easily able to access the equipment with your remote controls. 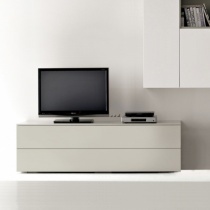 The best part of the open shelves is that you can choose to have them in a completely different colour than the rest of your TV table – so for examples you can have a white high gloss tv unit with a mustard yellow open shelf, like this tv table. 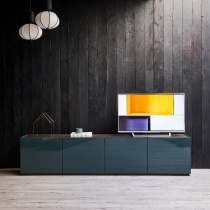 Made in Italy, our designer TV cabinets are available in a range of contemporary colours and finishes such as dark oak, matt or high gloss lacquers, so if you are after a bright blue (or red, yellow, orange, green, white, black..) high gloss TV unit, then you have come to the right place! Visit our showroom in west London where our helpful sales team will be able to assist you in picking out the right TV storage unit for your requirements. There are also additional options of cable management, so for a more personalised service drop in to our store, or to speak to one of our adviors about our modern TV units then call us on 0845 527 9697.